Wow, that's the first time I've typed that (correction, that was 5 days ago, I've obviously written it since, I just haven't published this until now)... hard to believe it's 2016. There's a lot that's been going on and I hope to one day catch up, but for now, we'll start fresh -isn't that what new year's are all about? 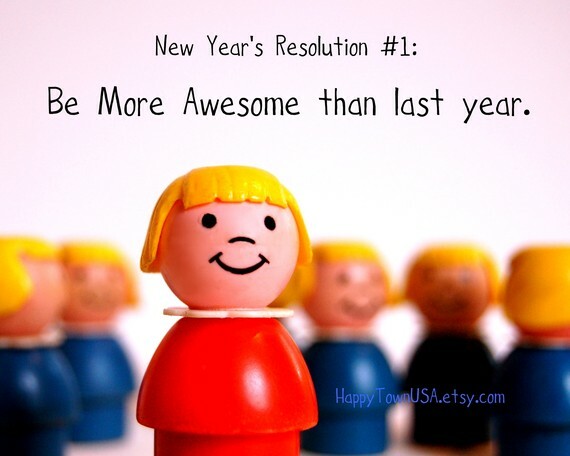 For the first post of the year, let's do New Year's resolutions! The last set I have on the blog are from 2012 - guess if one of them was to blog about new year's resolutions, I failed! Anyway, let's see how many of these I'm going to recycle! 1. Work out! Or get back to running. Or just try to be healthier. My goal is to run this year. I've talked about it a lot, but this is the year I actually do it. I'm not sure if this means running a 10k, or a 10 miler or a half marathon, but I will do some race... I figure this is the year I decide truly whether running is for me. I figure if I don't do it this year, then I can cross it off my list. No pressure, just reality. There are other ways to be active and stay fit (I think). My diet could also use some cleaning up. I'm back to eating too much processed food, drinking too much diet soda and booze. I know I'm not giving it up (ever), but I could probably clean it up a wee bit. 2. Organize my house! Or finally start living like an adult. 2a. Finally do stuff to the house. I've been putting off doing stuff or updating stuff, but there are things I want to do and this is the year I'm going to do it. First on the list, buy a rug for the living room. It drives me insane that the rug we have in there is too small for the space. We (ahem, Huge) bought it on a whim and it just doesn't fit. And it annoys me ALL.THE.TIME. But I always had "better" things to spend my money on... but I realized it's not that expensive to replace and it will make me less annoyed. Win-win! So small improvements that will make me less stabb-y (yes, I realize this makes it seem like my priorities are all warped, but indulge me in my hyperbole), are worth doing. I've already ordered the rug so we're on our way! 3. Read 25 books this year. I had a goal last year to read 20 and I made it to 22 (very proud of myself), so I do believe it's doable, I just need to make more of an effort to read instead of spending time on the inter webs. 4. I had a goal in 2012 about work -it was something along the lines of work less, stress less (If I wasn't so lazy I would look up the exact wording). I'm in a new job (as of 8 days ago), so I can't comment on the workload (expected or self-imposed) will be,but I think my goal for work is to stay out of my comfort zone. I have a feeling that there will be a lot of opportunities for stretch assignments and growth if I'm willing to take them and ask for them. So my goal is to be aware that sometimes I don't like being out of my comfort zone and to do it. Prime example, I'm blindly setting up meet and greets with department heads -something I would never do before. I literally have no idea what they do or how we'll be working together so not having a fixed "agenda" is scary. But it's been met positively and I think is a valuable foundation to build these work relationships. I'm the new person, something I haven't been in a long time. 5. Be more present and as I like to say "just be". I find myself on my phone or not really being engaged as much as I should be... this happens at work and at home and I'm doing everyone a disservice. So it's cliche, but it's a reminder to be more content and to be more present. 6. Get back on track financially. Don't worry dad (if you're reading this), we're not in the poor house (yet), but we're not as financially secure as I'd be comfortable with. I'd like to have more liquid savings, I'd like to have more in the retirement and kids' accounts and I'd like to have more money to spend on things I deem important. Again, nothing crazy, but I'd like to just feel more "adult" about my life. Maybe that's the theme for 2016. Pretty self explanatory, but I have not documented Nora's life nearly as much as Callan's and there are so many things to remember that I've already forgotten. And she is a she-devil, but she's funny! And Callan is turning into this actual little boy! It's crazy how that works :) But, I'm forgetting all these things and there are so many people who want to know about the nuanced monotony of their day-to-day that they're missing out on... so as a service to them (and me), I want to blog more. Get back into it because it is fun to go back down memory lane. That ended up being more than I thought I would have, but I think that's it. Oh ya, there is this, my favorite resolution of all. 2016, bring it on -I have a feeling it's going to be a good one.